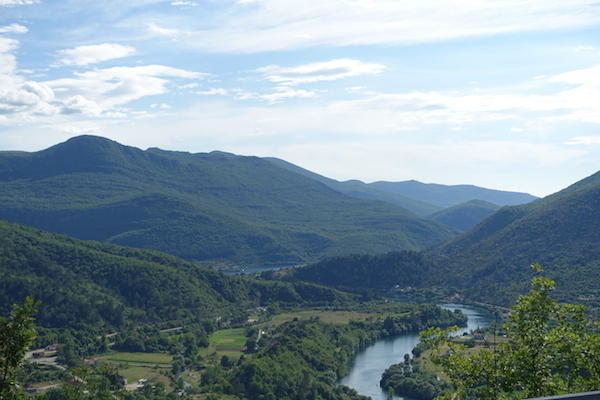 Mostar looked a lot more appealing from a distance as we headed away into the Bosnian hills. 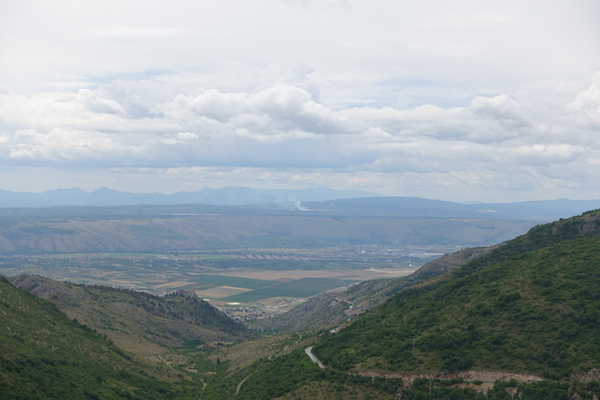 Over the hill, as the road wound its way slowly eastwards, stunning valleys, seemingly yielding plenty were punctuated by a few towns with people busily going about their business and impressive mountains always in the distance. Since there are not any campsites marked on our map our destination for the evening was Montenegro but we kept an eye out in case we could find a place to stay. Tiny villages of red roofed stone cottages appeared occasionally in the verdant valleys with shepherds tending their flocks of sheep and goats. A few large towns offered the chance for food and fuel but no camping. Entering the republic of Spraska (pro-Serbian part of Bosnia) their allegiances are clearly demonstrated by flags and even a huge painting of Milosevic on the side of one concrete block of flats in an industrial town. Very mixed emotions as we travelled on, wanting to stop, experience the country, the people their cuisine and their culture more but nowhere to stop other than small cafes, most closed and those that were open, with only men sitting on the shady terraces. It just didn’t seem appropriate or feel right for us to descend and interrupt. Reluctantly we drove on, lunch a picnic in the van of foods bought along the way and fresh bread bought in the village as we left our camp in Croatia. It didn’t feel right at all to be simply passing through Bosnia and pulling off the road into a hidden lay bye to sleep didn’t either, so without a legitimate campsite, Montenegro was our only option. Another strange and surprisingly easy border crossing as we passed from Bosnia into Montenegro where the stunning scenery continued. Another green card needed we knew; British insurance companies will not insure your vehicle outside of EU but it’s easy to purchase a green card / third party insurance at each of the borders. When we asked the border guard where we could purchase he pointed to one of the numerous closed doors of offices alongside the border posts, finally we found the right one with a rather surprised and sleepy looking but very friendly man behind a desk who fumbled around in various drawers for pens and what looked like an official piece of paper to complete and become our insurance during our time in Montenegro. ‘Good luck’ he said as we thanked him and headed back to the van – gosh will we need it we thought?! We didn’t need it, the roads were small and windy but almost empty as they passed through the breathtaking landscapes. We didn’t see any evidence of tourists or facility for travellers until we reached the lagoon at Kotor, clear blue waters surrounded by forested mountains a beautiful place that a few holiday-makers were enjoying and hopefully in high season, more do as it is a stunning a relaxing place. A stroll took us to Konoba Catovica Mlini hidden away in a cluster of houses by the side of the lagoon, a preternatural but wonderful place at the same time. A traditional stone house at its centre and with ornate stone paths and footbridges leading over streams and ponds of flinty clear water and filled with rushes and plants where water bubbled up from the earth. The fresh water springs have brought lush vegetation and it seems, affluence. 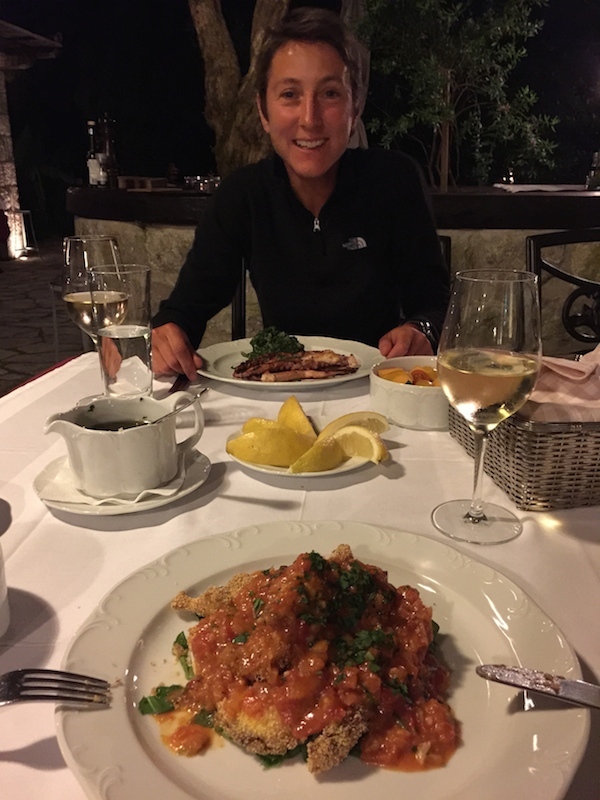 We enjoyed octopus, salad and a local white wine as we watched the sunset across the incongruous formal gardens. In Bosnia we had seen a beautiful landscape divided by politics, not prosperous but functioning whilst many hold on to tradition and strong beliefs. In Montenegro we had experienced a place of extreme contrasts rural landscapes, hill towns seemingly stood still in time and affluent towns welcoming international travellers and the small section of coast line packed with hotels and houses along the small beaches yet weirdly not spoilt (yet). A powerful, inspiring and thought provoking few days, people struggling, people recovering, people prospering and all in some of the most incredible scenery in Europe. 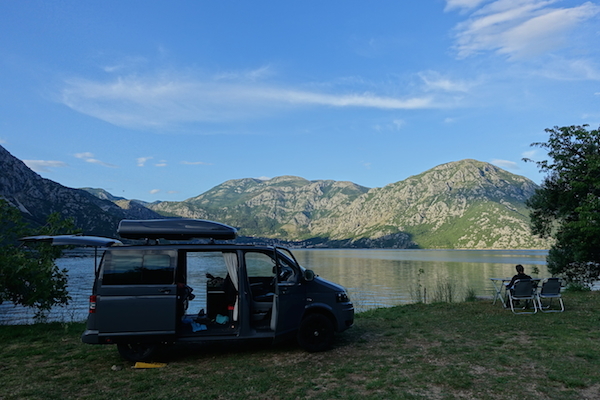 We planned our route for the next few days in the serene early morning by the Kotor bay. Kotor is a regular call for cruise ships but it seems you found somewhere quiet.